There are often other technology leaders and opinions within an organization, but part of what sets a CIO apart is his or her role as a business leader who must have their finger on the pulse of the business. The CIO has to have a firm grasp on how the business operates so they can know how to best leverage new technology to deliver a world-class experience to customers. In order to know how to best use technology to help customers, the CIO must have a good understanding of customer and work to build a relationship of trust where customers can be honest about the solutions they are looking for and what would make their lives and shopping experiences better. Vic views one of his main roles as supporting and advocating for customers, both internally and externally. Internal customers, or employees, who have great technology experiences can pass that on to external customers. Consider how a call center employee who is frustrated with a slow computer or outdated system affects the mood and experience of a customer calling in with a question. Conversely, an employee who has the tech tools to do their job can focus on providing a great experience to customers. The CIO can have a good understanding of what customers want to be able to provide them the solutions to best perform their jobs and be happy. At Verizon, Vic and his team focus on helping companies focus on their core capabilities instead of their core capabilities. If there is an area that is a chore for a customer that would be considered a core at Verizon, the company can take it off the customer’s plate and allow them to focus on their core abilities and goals for growth. The idea of customer experience isn’t new. However, with the tools available today, we can create a better and more innovative experience than ever before. The CIO can play a role in making sure the right technology to meet customers’ needs is implemented within the organization. 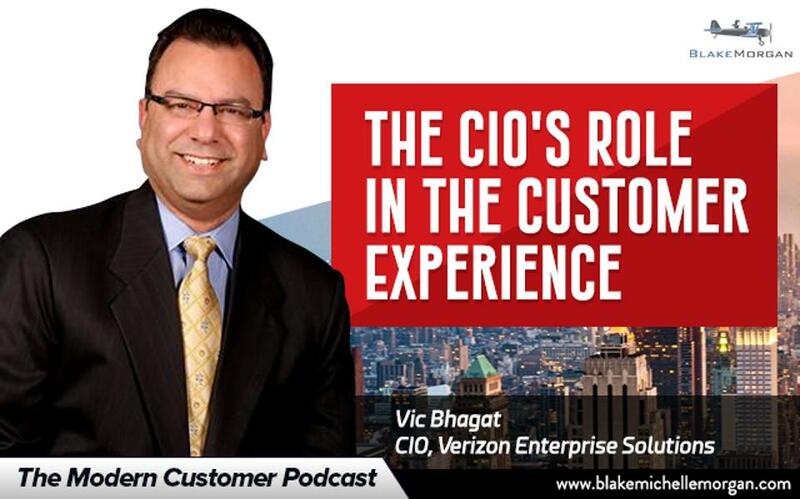 The CIO’s role, especially when it comes to customer experience, is incredibly important. With a strong understanding of customers and the effects of technology, a CIO can create innovative solutions and a great environment for customers.